There are different levels of severity that call for different home foundation repair methods. At RaiseRite, when identifying and proposing a responsible resolution of foundation issues with your home, we follow the standards set forth by WAFRP (Wisconsin Association of Foundation Repair Professionals). So, what types of solutions are available to you if you have home foundation issues? If your foundation walls are bowing inward, you may have an issue where the outside soil is creating pressure which is causing your walls to bow. If a wall is bowed/tilted more than 1″ (one inch), then the exterior surrounding your home should be excavated, and your foundation wall should be pushed back into place. After the professional foundation repair contractor has successfully repositioned the foundation wall(s), a non-expansive material is used as fill to prevent future pressure from expansive soil. If one, or many, of your foundation walls are tilted/bowed less than 1″ (one inch), then reinforcement beams can simply be installed to prevent future movement. 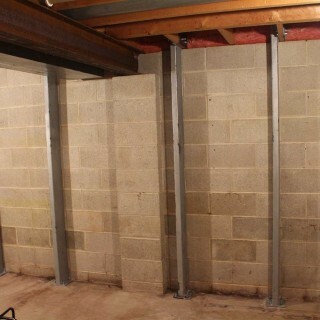 Reinforcement beams are used as braces keeping your walls from bowing any further than they already had. When beams are installed to secure the foundation of your home, they will be attached to the floor joists and also anchored into the footings, in order to hold the wall in place. If we find that there is not bracing available to install beams, helical tiebacks may be used. Take the hassle and mess out of tarring your foundation! Takes 1 hour as oppose to one day. Provides a moisture barrier and seals all cracks; even hairline cracks. If you believe your foundation is compromised and is resulting in bowed walls from the pressure of the outside soil, we recommend you obtain a professional evaluation! A helical pier system is ideal for stabilizing foundations and slabs that are built on questionable soil. It also provides seismic protection, tieback anchoring, deadman anchoring, and fixture anchoring. Helical piers are manufactured under strict quality standards and are only installed by experienced contractors (like us!). We Install Deck Helical Piers too! For over 40 years, we have been helping home owners address and fix foundation repair concerns, and have installed over 5,000 piers with just a .1% adjustment rate. We have had zero (0) product warranty claims for our foundation repair services! If your home is unstable due to foundation settlement, do not wait. Resistance Pier Systems are installed for the purpose of stabilizing and re-leveling your home, they stop the settlement, but also restore the foundation and structure of your home. When resistance pier systems are installed for the purpose of stabilizing and re-leveling your home, structural defects and deformities such as cracks in your foundation walls are often closed. » Watch our Resistance Pier Installation Video! When we install resistance piers for home foundation repair purposes, we use portable equipment, which allows the resistance piers to be hydraulically pushed to the bedrock, or to a measured design load strength. Resistance pier systems are manufactured under strict workmanship and material standards, and are installed only by qualified contractors. For over 40 years, we have been helping home owners address and fix foundation repair concerns, and have installed over 5,000 piers with just a .1% adjustment rate. We have had zero (0) product warranty claims for our foundation repair services! Contact us today for more information! Using portable equipment, an expert foundation repair contractor like RaiseRite can get up close and personal with the structure needing to be leveled. The soil surrounding the area of instability is removed to allow for our engineers to access the foundational slab of the home. Once the surrounding soil is removed, we attach the brackets required to guide the resistance piers down to the bedrock, providing the opposing force against the foundation of the home. Upon installation of the foundation brackets, resistance piers are hydraulically pushed deep into stable soil, which when placed in series, can lift more weight and more structure. The amount of piering required is dependent on the depth of the stable bedrock below. When all necessary resistance piers are in place and the building has been lifted back to its original position (or as close to original position as is possible), the area where soil was removed can be refilled and landscaped, leaving little to no trace that any work was done.